The RSI or Relative Strength Index is one of the most popular and classic indicators that is used by technicians far and wide. 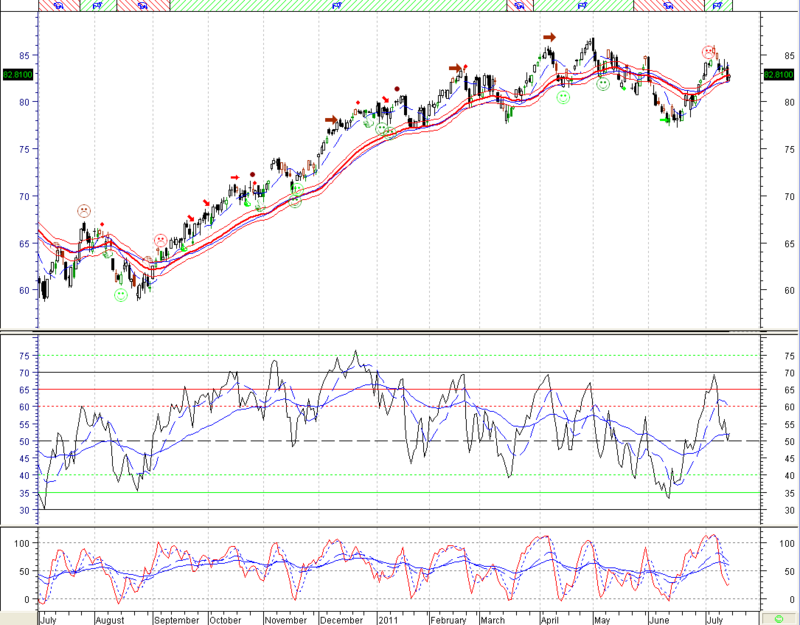 Developed by Welles Wilder, the RSI has been one of if not my favorite indicators since very early in my career. I probably started using it by reading Murphy and other Technicians talk about the classic indicators. In my research I came across Andrew Cardwell who was said in a few places to be the person who really refined RSI analysis to get the most out of it. In fact many say Andrew knows more about using the RSI than Wilder himself. I contacted him to see if I could learn more about how to use the RSI. Not only were Andrew’s books out of print, he also was not doing much speaking anymore and at the time didn’t have a website. After talking with Andrew for a while, I decided to get his seminars which is where it all began. During the time I was studying the seminars I was also reviewing a few days a week with Andrew himself. After the more than 24 hours of audio with endless charts along with regular reviews, I had learned a ton that doesn’t show up in basic RSI work in most technical books. Going through the course in the beginning was like trying to take a sip of water from a fire hose! I went through the courses 3 time in a period of 4 weeks and still don’t think I caught everything. Since finishing the courses almost 5 years ago Andrew and I have become friends and continued to review charts when we think something is happening. More recently Andrew put together a small group of students into a private trading group that reviews markets and shares ideas utilizing his RSI work. He calls this his RSI Edge think tank. Andrew is not only a terrific technician he is also a great mentor and the second best coach I have had the pleasure to work with (behind only my father who was a state champion basketball coach). In the end I got a lot more than just a seminar on RSI. Today Andrew has his website www.cardwellrsiedge.com or email him at Andrew@cardwellrsiedge.com where you can get his seminars without the heavy research it took me. I will vouch for the seminars being well worth it for anyone who uses RSI as a primary indicator and is serious about trading. In this series I won’t even be able to cover near the detail I learned, but I do want to put more color on much of the information that is already out their in places like www.stockcharts.com as well as Connie Brown’s and John Hayden’s books about what I view as Andrew’s work. I know I learned a ton from my time working with Andrew and hope to pass a little along here as well as give credit where credit is due. The Chart below is an example of a basic chart setup I have from just one angle of Andrews RSI analysis. These are not the charts I usually put up on Charlty, but if I am serious about buying something this is just one of the RSI configurations I will use in my analysis. I will use these charts in this series so get familiar with them. Andrews’s analysis has changed the way I look at RSI, Charts and Trading for the better. Now, on with the show. Below is the planned outline for the series, I will change them to links on this page as I post them as well as tweet them on StockTwits and Twitter from @gtlackey. I know this exercise is going to be great for me as I always learn something new when I review great material; but I also hope to add value to your analysis as well, so please feel free to email me at tommy@blfgria.com of you have any direct questions from the series. The last part of the series is going to be an interview with Andrew that I will conduct after the series is finished. This will give time for you to send me questions to ask Andrew and I will use the best of the bunch. Please email me any questions as the series progresses and I will hold them until it is time to choose those that will make the cut. Good Luck, it is there for the making! To get all my posts and charts follow me at @gtlackey on StockTwits or Twitter. BLFG is not affiliated with Cardwell Financial Group.